I found this easy and healthy recipe on "Cooking Light" and varied it slightly. It is filled with flavor and nutrition. The basil and lemon zest are a must. Place asparagus in a shallow dish. Add 1 tablespoon oil and 1/4 teaspoon salt, tossing well to coat. Place asparagus on grill rack coated with cooking spray; grill 4 minutes or until crisp-tender, turning after 2 minutes. Combine remaining 1/4 teaspoon salt, lemon juice, lemon zest, and next 3 ingredients (through garlic); stir with a whisk. Slowly pour remaining 2 tablespoons oil into vinegar mixture, stirring constantly with a whisk. Stir in capers. 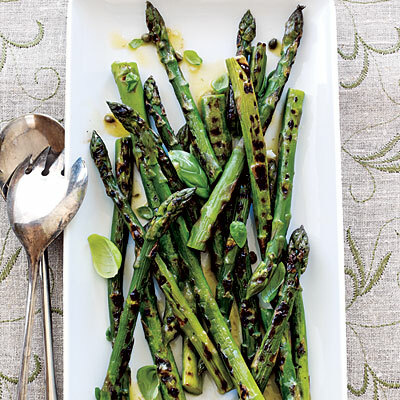 Arrange asparagus on a serving platter; drizzle with vinaigrette, and sprinkle with basil. If it is too cold for the grill or you don't have a grill, this recipe can be adapted to indoors. After tossing the asparagus with the oil and salt, place the asparagus on a foil lined baking sheet. Turn your oven to broil (high) and place the pan about 6 inches away from the flame. Turn asparagus when it begins to turn crisp-tender (about 4-5 minutes). Broil for another 3-5 minutes. Follow Step 3. Before you slice the lemon to extract the juice, use a hand-held grater to grate the outermost rind of the lemon. Be careful to only grate the colored part of the peel. The white pith can be bitter tasting. Asparagus has a slightly warming thermal nature and has a bitter and mildly pungent flavor. It contains the diuretic asparagine which helps to eliminate water through the kidneys. Asparagus treats many types of kidney problems but should not be used when there is inflammation. It helps to cleanse the arteries of cholesterol and is useful in vascular problems such as hypertension and arteriosclerosis. 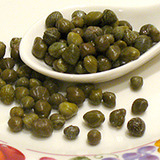 Capers are the unripened flower buds of Capparis spinosa, a prickly, perennial plant which is native to the Mediterranean and some parts of Asia. After the buds are harvested, they are dried in the sun, then pickled in vinegar, brine, wine or salt. The curing brings out their tangy lemony flavor, much the same as green olives. The size of the buds range from tiny (about the size of a baby petite green pea) up to the size of a small olive. The smallest variety from the South of France, called nonpareil, is the most prized and comes with an equally notable price-tag. Larger capers are stronger in flavor and less aromatic.